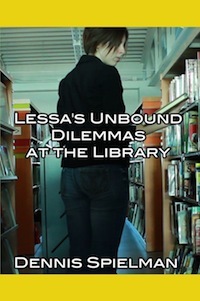 In my interactive urban fantasy adventure book, follow librarian, Lessa, in a typical night of closing the library. As usual, the characters have come unbound from their books to roam the library at night. But this time one of the characters wants to be free of the library and will do anything to guarantee his freedom. Enjoy multiple story paths with four different endings! Get the eBook now for $0.99 for Amazon’s Kindle and Barns & Noble’s Nook and over time the story will be updated with new adventures! The book will soon be available for the iBookstore. The book is only available in digital right now as I can update it with new sections over time. This book was written as a Christmas gift for a friend and I had a few copies of it printed for the occasion.